Discovered by the Grammy Award-winning record producer Stevie J at a club stripping for livelihood, Joseline Hernandez’s life took a big turn in 2012 when she became part of the original cast of VH1’s hit reality show, Love & Hip Hop: Atlanta now averaging 3.5 million views per episode. She is an American reality television personality, rapper, singer, and actress who came into the spotlight from her six seasons appearance as the main cast member on the VH1 reality series “Love & Hip Hop: Atlanta”. She released her singing debut, Bailar in 2012, and a series of other singles such as La Negra and Baby Daddy via iTunes. She has appeared in different TV shows notably as Michelle, a stripper in TV series “Star” on Fox, as a guest co-host on the syndicated talk show “The Real”, the spin-off show “Stevie J & Joseline: Go Hollywood” to name a few. 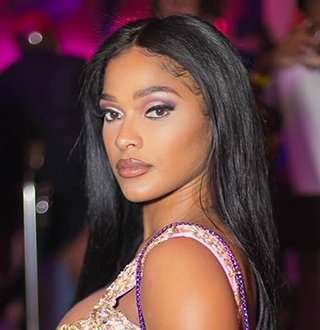 Joseline Hernandez was born on November 3, 1986, in Ponce, Peurto Rico and grew up in the public housing system of Puerto Rico. She moved to Florida at the age of 6 with her mother, step-father, older sister, and four brothers. Talking about her parents, her father died from a heroin overdose and her mother also struggled with drug addiction. She had to leave home and start stripping from the age of 16, in order to support her siblings, as her mother could not do anything for them due to drug addiction. She was even arrested in 2003 and 2007 as Shenellica Bettencourt for lewd and lascivious behavior. Her real name is Joseline Hernandez and has nicknames Shanelica Benacourt, Jose, Puerto Rican Princess. Joseline has a perfect curvaceous figure with a height of 5 ft 5 in and weight of 134.5 pounds. She made her first TV show appearance in 2012 in the VH1 reality TV series, Love & Hip Hop: Atlanta. The black beauty with a body measurement of 36-28-39 inch formerly stripped to help pay for the mortgage, food, and medical bills for her family now holds a net worth of $300,000. Joseline made the headlines of American media from her relationship with American DJ, record producer, and television personality Stevie J back in 2012. Both of them met at the Onyx Club in Atlanta, where Joseline was a stripper. Producer Stevie appointed her as the main cast of his show “Love & Hip Hop: Atlanta”, in 2012 where he was the main protagonist. Both of them got romantically and sexually involved with each other, although Stevie was officially dating reality TV star, Mimi Faust at that time. Joseline and Stevie claimed that they were married in 2013. But Stevie admitted in 2016 that they had faked their marriage for publicity and they were never married, however, it looked like they were engaged as Stevie is often referred to as the ex-fiancee of Joseline. The same year Joseline gave birth to daughter Bonnie Bella on 28th December, and DNA tests revealed that Stevie J. is the baby father. But the couple separated in 2016, just a few months before the birth of their daughter as Joseline accused Stevie of cheating on her with his new protege Estelita Quintero. Joseline was given the primary physical custody of baby Bonnie while giving Stevie J. joint custody by Georgia Court after a nasty custody agreement over their daughter in April 2018. Stevie is ordered to pay $1000 per month to Joseline in child support. She even accused Stevie J. of not seeing their two-year-old daughter in several months and owing more than eight months of child support in January 2019.